Want to learn the secret to awesome game design? I’ve put together a list of 20 essential indie dev tips for game design and development success. Whether you’re just starting or have a couple of games under your belt, these must-know tips can help you design better games and feel more confident as a developer. The expert at anything was once a beginner. The same goes for game design. If you want to make incredible games, you have to gain experience. And the best way to learn is by doing. If you haven’t been making games for years, your game design skills won’t be on par with other devs, at least not yet. So, don’t try to create a masterpiece on your first attempt. Completing your first game ever and releasing it into the App Store should be your main goal. 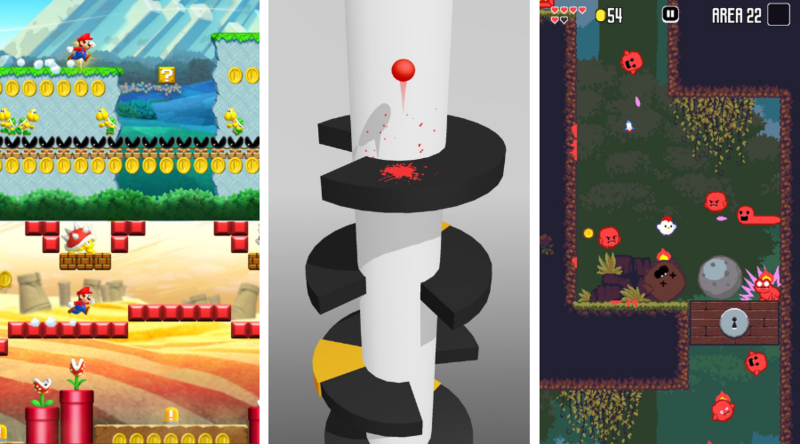 Choose a simple, minimalist art style and create a hyper-casual game. Then you can work your way up to animated characters and more complex gameplay. Start small to gain experience to help you master the art of game design. Remember, it takes time to learn how to use new tools, engines, and make art. So, if you take on a big project before you’re ready, you’ll end up overwhelmed and ultimately quitting. Avoid this common pitfall by focusing more on the experience than the outcome. 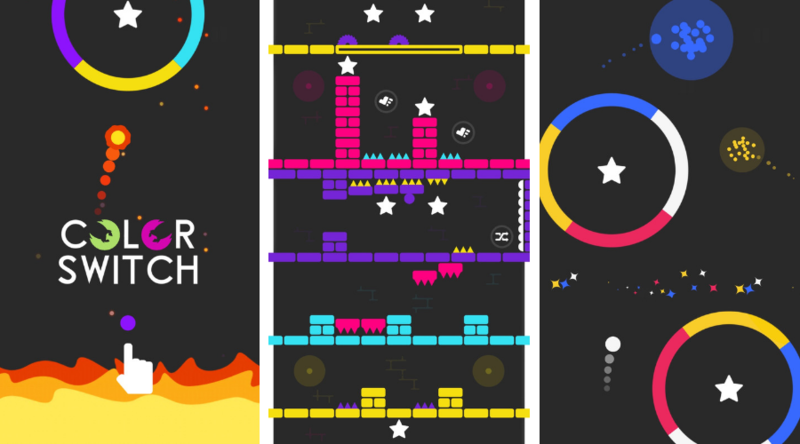 Color Switch: A good example of awesome game design. So, be okay with your first game being ‘not-so-great.’ It’s alright. You’re new to making games. Just try to improve and make each game you create better than the last. It’s the secret to mastering anything, including game design. Save your BIG game ideas for later, after you’ve acquired the necessary skills to do it justice. While you’re making games, you should also be studying the rules of game design and applying them. We’ll touch on many of these today in this list, but studying game design, in general, is important. There are tons of game design principles, techniques, and even hacks that you can practice. Make it a habit of reading articles (like the ones on our Buildbox blog), game design books, and tutorials on the subject. There are also some great YouTube Channels on Game Design that you can subscribe to and watch to learn more as well. Always be a student. A few game design books that should be on every indie’s bookshelf are Jesse Schell’s The Art of Game Design, Eric Zimmerman and Katie Salen’s Rules of Game Design, and Scott Rogers’ Level Up! Also for generating killer game ideas and concepts Michael Michalko’s Thinkertoys is a must-have. Immersing yourself into the world of gaming is also crucial. Get involved in the gaming community by joining popular forums for game development and games like TouchArcade. Also, make it a habit to check the top charts on a regular basis. Try to keep up with the latest mobile game trends and play them. To get good at game design, you have to play a lot of games, but with purpose. So, when you’re playing, pay close attention to their design, the flow, the UI set-up, graphic style, and gameplay. Take notes. And if you haven’t played any of the classics before, check them out too. Many of the retro games like Super Mario, Donkey Kong, Tetris, and Space Invaders are also excellent examples of game design. Studying both the past and what’s working right now will give you a better overall understanding. Another game design tip is to practice the ‘model and improve’ method. This technique involves studying successful games similar to the one you wish to create. Finding out what’s working and which elements of the game could be better. And then brainstorming ways to improve it to make a totally new game. You can do this by adding and or removing different aspects until you have your own unique game. Maybe the theme would be cooler if it was set in space instead of a forest. Or the gameplay mechanics might be fun to play but not as challenging as it could be, or the graphics are ‘meh’ and need improving. When you use the ‘model and improve’ technique, you use different aspects of popular games as inspiration for your game, taking bits and pieces and molding them to make something new is key. Most games are modeled or inspired by others. Nothing is truly original. The key is to make enough changes and tweaks, so it’s not a carbon copy. Never copy or clone, it can get you into trouble. Always add and modify for awesome game design. However, there’s one hack that no matter what, that you should definitely incorporate into your daily routine, and that’s keeping an idea journal. These indie must-haves can be digital via a notepad on your smartphone or paper based. Just choose the type that you feel suits you best, and use it. Write down all your game design ideas. And keep it with you for when you’re suddenly inspired. For paper-based journals, I recommend using memo or pocket-sized notebook to jot everything down. It’s much easier to carry. Plus, you never know when inspiration will strike. Having an idea journal with you when you’re out whether it’s via your phone or notepad can come in handy. Awesome game design is often unique but familiar. Most successful games are designed to be both original while having a level of familiarity to it to make it easy for players to understand. You never want to make your game overly complex or so unique that it’s a difficult grasp. Players want to be able to jump right in and start playing with minimal instruction. So, when you’re designing your game, it’s important to use the same popular gameplay mechanics that gamers enjoy. And build upon those core elements to make your game different. There’s no need to reinvent the wheel. You can use the ‘model and improve’ technique to help you add interesting new elements into your game to make it fresh. There’s a great quote by Emmert Wolf that states, “A man is only as good as his tools.” The same can be applied when making games. To create professional looking games, you need the right tools. But here’s the catch, everybody is different. What works well for one person may not for another. So, the secret is to choose the right tools for your current skill level and need. This goes for all tools, whether it’s a game engine, graphic design, or animation software. For example, many of the graphic design software options can vary in features and price. Try to consider the learning curve that’s required. Are you a beginner, intermediate, or advanced user? And what can you afford, right now? If you’re still learning your way around design, you have to choose the best tool for you to use to get the job done. Do your research, comparison shop, and weigh your options. Size matters, especially in game design. So, avoid the common mistake of making your game’s characters or objects too big. Characters that are too large will slow down your game and hinder your players’ overall gaming experience. Whenever you’re in doubt, go small. A cool game design hack for sizing is to compare your character size to popular games that nailed it. All you have to do is take your game’s images and a few from the game you want to compare it. Load both of them into a graphic design software like Photoshop and see how much they differ. If it’s too big or small, you can easily change the size within the software and save. An excellent game to use for size comparison is Super Mario Bros. The classic platformer is a perfect example of how to scale your characters. It’s good to use popular games that are in the same category as your game too. Always choose the best possible color palette for your game. It’s important to get the color scheme and combinations right in the beginning. Every polished game has a great color palette. If picking which colors go best together isn’t your forte, don’t worry. There are plenty of great free color palette generators and color scheme tools that you can use. Two excellent ones that are worth checking out are ColourLovers and Hail Pixel’s Colordot which also has a handy mobile app. Also, a good rule of thumb to follow is to lean towards more muted colors in your mobile game design. Try to avoid using overly saturated colors. They can often be hard on the eyes, especially when used in excess. 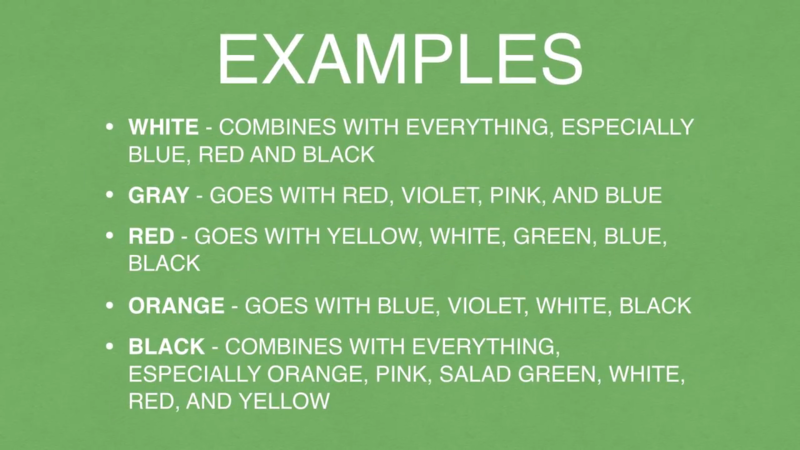 In our 4 Mobile Video Game Design Tips video, Zack goes further in depth on the process of choosing the right color themes for your game. It’s a must-watch! Tip #10 – Keep Things Simple! Don’t forget to keep things simple. You never want to overcomplicate your initial design. So, try to avoid adding too much, too soon in the beginning. Focus on keeping your design very basic and perfecting your gameplay mechanics. As you build out more levels, prototype, and test you can add more details and complexity. Your game’s graphics are the first thing that your players will notice. So, it’s vital that you don’t cut corners or use low-quality game art. Everything from your app icon and screenshots in your store listing to your actual game graphics should look amazing. They all help sell your game and add to the overall experience. Try to make sure your game’s graphics are just as good if not better than the other competing games in your genre. If you’re not good at making your game art, there are tons of game development resources like Itch.io, Game Dev Market, and Open Game Art where you can score free game art. You can even use sites such as Fiverr or Upwork to find an artist to create custom game art for you. If you’re unfamiliar with how outsourcing sites work, this comprehensive review on Upwork can help give you some insight. Games are an interactive form of media. Much like music and film, if it’s any good, it will evoke some emotion. Adding sound effects and background music in your game can make your players really get into your game. Your game’s art, theme, and sound should all compliment each other. Using the proper sound effects can set the mood or pace throughout the game. So, choose it wisely. Try to match it with your gameplay type and theme. For example, if you’re making a horror game, you can add creepy sound effects like howls or a witch cackle or for a fast-paced runner up-tempo beat to help get players pumped up to win the race. You can make your own sound effects if that’s your thing, or find free game sound effects and music online. There’s a very thin line between creative and tacky. To help keep you from crossing that fine line, try to create and apply universal laws for your game. The goal when using universal laws in your game design is to create consistency. Of course, that doesn’t mean everything has to be all matchy-matchy. But you do need to have the same style and theme throughout your game. For example, you could have all of the buttons in your game colored orange to compliment the color scheme that you’re using for your background. Consider your chosen art style and color scheme for your game and adhere by it. Although it may be tempting, do not stray. You should also try to add surprise and wonder in unique ways. Following this game design tip will give your game lots of replay value and retention. Both are keys to successfully turning any new player into a fan of your game. Adding surprise and wonder into your game design is much easier than you may think. You can instantly make your game more exciting by adding hidden portals that will suddenly transport your players into bonus zones. A great example of this is our game, Bruce Lee Dragon Run, published by Ketchapp. Throughout the game are hidden portals that when you jump through, your character transforms into a fire-breathing dragon flying in the sky collecting bonus coins. It’s pretty cool, and just one of many ways you can creatively use portals. Cool power-ups that give your character speed, invincibility, or a special weapon can also add surprise and wonder in your gameplay. You can use unlockable characters and items in the same way to make your game more fun. Awesome game design has balance. The gameplay is equally tricky and challenging while still being fun to play. When you’re designing your game levels, aim for balance. Avoid making your game too easy. Easy games are boring, and players will quickly lose interest. But try not to make it too hard either. If your game is impossible to beat your players will feel cheated. Shoot for the middle ground. Try to make your difficult but beatable. Don’t rely on your own judgment to decide this though. Test your game on a wide variety of people to help you find that ideal level of difficulty. In game design, prototyping and testing are also vital. It’s the best way to find out early on in the design process what’s not working and if any significant changes need to be made. Prototyping is also great for testing your level design. You can play around with different ideas and choose the one that fits your game’s concept the best. Maybe originally you had your character flying, but after playing a rough prototype, you discover that jumping from one platform to the next works better. When you make a playable prototype you get an instant feel for how your game will look and feel. Testing often is also necessary. When you test, try to look for errors and areas that could be improved. Seek feedback on your game using beta testing tools and even forums. Feedback can be a valuable tool during the design process. It provides you with a different perspective and deeper insight into how others view your game. So, always seek feedback from as many people as you can. Show your game to your friends, family members, co-workers, and even strangers to get their opinion on your level design, concept, and graphics. You can also use game development forums like our official BB forum, TIGSource forum, and sites like TouchArcade. When you’re designing games, don’t be afraid to start over, especially if it’s not working. We’ve all been there, you’ve spent hours or months even, working on your game but it’s still off. When you hit more roadblocks than you can count it’s usually a sign, you’re heading in the wrong direction with your game design. Step back and reassess the situation. Use beta testers and seek feedback from multiple outside sources to gain a better perspective. And if you’ve done all you can to make it work, but with no avail, it may be time to make a new start. Scrapping your game project can be a terrifying thing for many new game creators, but it’s perfectly normal. So, don’t be afraid to start over from scratch. A game isn’t complete until it’s been properly polished. Although adding polish is one of the final steps in the game development and design process, it’s essential for success. The objective when you’re adding polish is to make your game cohesive in all areas. This includes much more than the graphics. Your game’s UI, controls, and even the gameplay should be consistent. When you’re adding polish to your game, you’re taking a close look at it and finding ways to perfect it. You’re making sure your T’s are crossed and your I’s are dotted. A polished game is also completely free of all errors and bugs. It’s been tested, and the design has been tweaked to look as professional as possible. All great games are polished. So, it’s vital that you don’t forget this last step when you’re designing. Tip #20 – Stick With It, Never Give Up! Learning anything takes time. So, be patient with the game design process and yourself. Avoid giving up when things get hard. Take a deep breath in and then out. And keep at it! You’ll be a Pro at creating awesome game design before you know it.